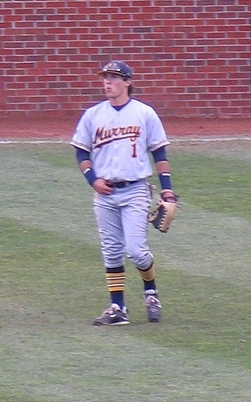 Murray State University senior outfielder and week four BluGrass Baseball hitter of the week Zach Noonan was named the Ohio Valley Conference player of the week. The University of Louisville checked in at No. 21 in the latest ESPN/USA Today Top 25 Coaches’ Poll. UofL checked in at No. 4, but Western Kentucky University dropped out of the most recent College Baseball Daily mid-major top 25 poll. UofL redshirt sophomore right-handed pitcher Justin Amlung and Lexington native and Cincinnati outfielder Justin Riddell were named to the Big East Conference weekly honor roll for their week four performances. Richard Durrett of ESPNDallas.com reports Ashland native and former UK right-handed pitcher Brandon Webb is scheduled to throw against live batters for the first time this spring on Wednesday. Jon Heyman of Sports Illustrated tweets the Colorado Rockies were disappointed right-handed pitcher Aaron Cook, who was born in Fort Campbell, didn’t report to camp in playing shape and Cook will not start the season with the team.